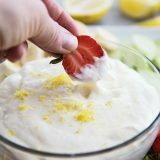 The easiest cream cheese fruit dip, this Lemon Cream Cheese Fruit Dip has marshmallow creme and cream cheese, plus lemon yogurt to give it the best lemon flavor. 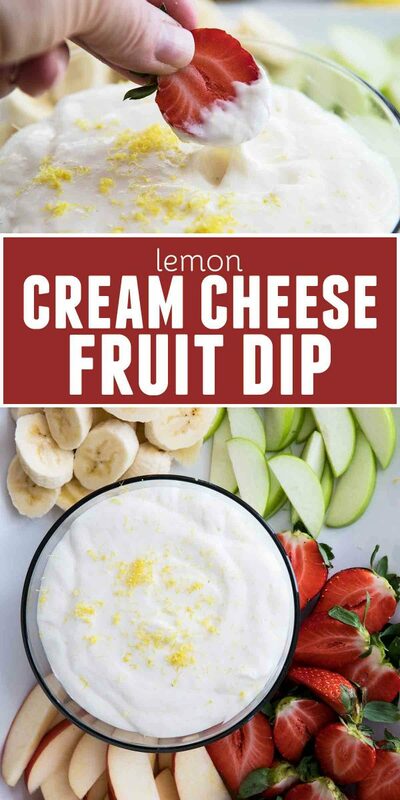 I love a good fruit dip. We eat a lot of fruit at our house, and 98% of the time, it’s regular, raw fruit. By itself. But a little while ago, I broke this recipe out again and made it and you would have thought that I was giving each of my children a $100 bill by their reactions. They ate the entire tray of fruit dipped in this fruit dip, and then begged for more fruit so they could keep dipping. That’s pretty much the reaction from adults when you take this to pot lucks or parties, too. Eyes light up, and everyone darts for the appetizer table. 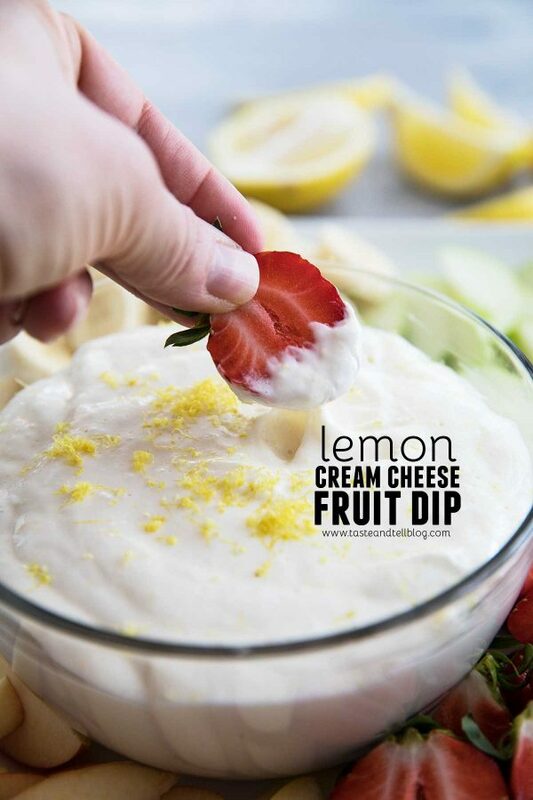 It’s a good thing this Lemon Cream Cheese Fruit Dip is so easy to whip up! 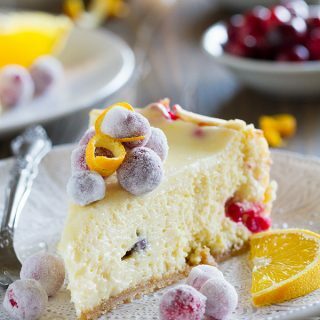 one container of lemon yogurt – I think this recipe would technically work with any flavor, but I have only ever tried lemon. But if you do change the yogurt flavor, I would leave out the zest. Unless the zest compliments your yogurt flavor! marshmallow creme – you can find this on the baking aisle of most grocery stores. Whipped Cream Cheese – You can find this by the normal cream cheese – it should be pretty easy to find. Lemon Zest – If you have a microplane, it makes this much easier! What Fruit Goes With Fruit Dip? All you really need for this recipe is a mixer – I just use my hand mixer. This recipe really does come together easily! Blend all fo the ingredients with a hand blender until smooth. I love bbq chicken sandwiches on a weeknight. Ready and yummy! Chicken Tacos are always easy and yummy! I follw Real Mom on FB. I follow Taste and Tell on FB. I follow Real Mom on Twitter. I follow Taste and Tell on Twitter. I would say that some kind of pasta dish is my “go-to” meal on busy nights. I can’t say I have a favorite one, but I want something easy and fast! Mini meatloafs are quick! Love them for a quick dinner that tastes like you spent longer. I follow Real Mom on Facebook. Most definitely TACOS! They please everyone at the table! Leftovers from a huge pot of chili made on the weekend. Unbeatable. And I follow Taste and Tell on twitter! My favorite weeknight meal is some sort of yummy grilled chicken with some summer squash on the side. I now follow Real Mom on facebook too. My favorite weeknight meal is Grilled Chicken Breast and Sweet potato fries with broccoli. I follow Realmomkitchen on fb. I follow realmomkitchen on Twitter. My go to meals are either tacos or grilled chicken with vegies and a rice or couscous. I am a Taste and Tell Facebook Fan. I follow Real Mom Kitchen on Twitter. I am a Real Mom Kitchen Facebook Fan. 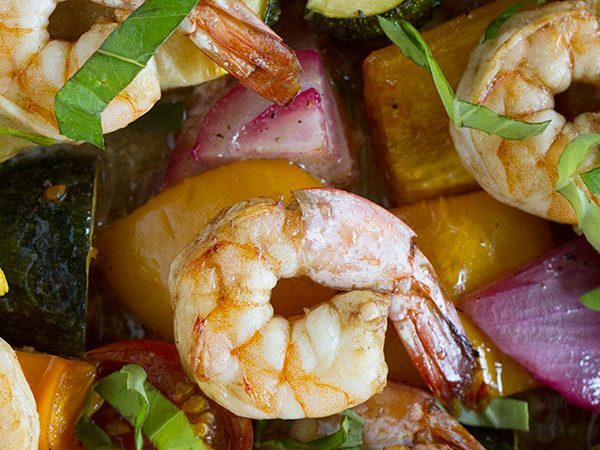 My favorite weeknight meal in the summer is a nice fresh salad with grilled chicken or shrimp, in the winter a stovetop chicken & rice casserole. My favorite weeknight meal is definitely a big salad. I love making it with quinoa or coucous and adding lots of chopped veggies, sun dried tomatoes, olive oil, lemon and salt. Yum! 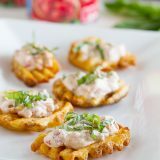 We love having several appetizers as dinner on the weekends! Follow Taste and Tell on facebook too. I hate to be mundane, but my favorite weeknight meal is chicken. Any way. In the spring/summer my go to is taco salad or veggie quesadillas. In the fall/winter, it’s soup (frozen homemeade) & sandwiches. I don’t have a specific weeknight meal, but anything easy that can be thrown together quickly. I also like casseroles I can make ahead for the family on nights I work late. I love breakfast-for-dinner, so it’s probably an omelet. Baked tofu with jasmine rice and whatever veggies I have in my drawer. Yum, love it. Olive and Tomato Penne. Its salty and delicious and takes 15 minutes to make (really and truly, I am not a particularly fast cook)! Oh, that’s an easy one: pizza! My boyfriend and I do zero cooking, so pizza is always #1 on our list! My favorite weeknight meal is chicken taquitos…sure to make my husband grin. Tacos or stir fry are both pretty standard weeknight meals for me. I love making easy vegetarian enchiladas for weeknight meals. 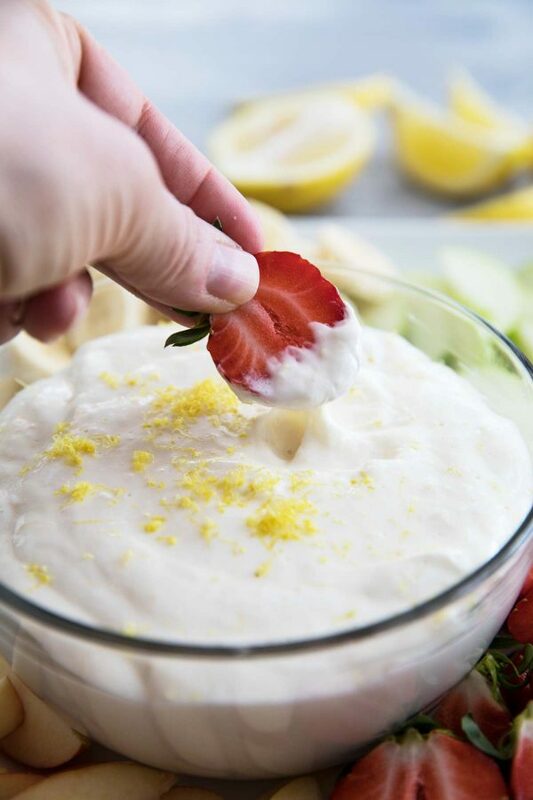 This lemon cheesecake dip sounds delicious! I am a fan of Taste and Tell blog on FB. I love a good BBQ!!! My go to weeknight meal is cilantro lime chicken with black beans and rice. One of our family favorites. I would say during the summer it is something cool, like a salad, sandwich, etc. I like to do some type of breakfast for dinner…my kids love it, it’s fast, easy and cleans up easliy. Our favorite weeknight meal is pasta with salmon, mushroom, peas and dill. ne of my favorite weeknight meals is breakfast. Waffles or pancakes with bacon/sausage and fruit. Quick, easy and the kids love it! 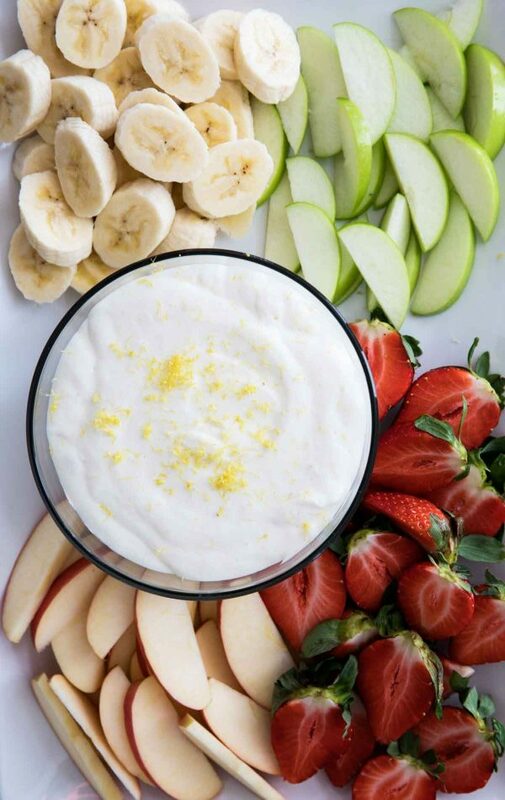 The fruit dip looks delightful! Cant wait to see some more recipes from her cookbook. 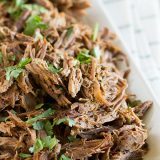 My go-to weeknight is either spaghetti (had it last night) or pot roast in the crock pot cooked all day. Creamy cajun chicken pasta…15 minutes to make and so good! I follow TnT of Twitter. My favorite weeknight meal is spaghetti. I love when we have spaghetti. We try to never have the same meal twice in a month, but we do usually end up having spaghetti at least twice! I follow Taste & Tell on Facebook – another one of my favorite blogs 🙂 I cannot wait to try your Buffalo Chicken rolls!! I love BBQ chicken that my hubby makes! 🙂 yum! Our favorite weeknight meal is either grilled chicken breasts or burgers with a salad on the side. That looks awesome! I’ll have to check out her blog. My go-to weeknight meal is pasta. It’s always satisfying! quinoa with stir fried veggies! You’re right…I definitely do want this in my life! It’s like cream cheese frosting, but more dip-able. Favorite weeknight meal is some kind of pasta dish – simple, satisfying & I know the kids will devour it! Our favorite meal is any type of stir fry- quick and filling and the kids will eat it every time. Sometimes they even eat the veggies without complainig! We like some form of Tacos or a taco salad. I follow Real Mom Kitchen on facebook. Also liked Real Mom on facebook. I follow taste and tell on twitter (as ohyoucook). I also now follow real mom on twitter (as ohyoucook). My favorite weeknight meal is tacos! Can’t go wrong. I follow Taste and Tell on Facebook! 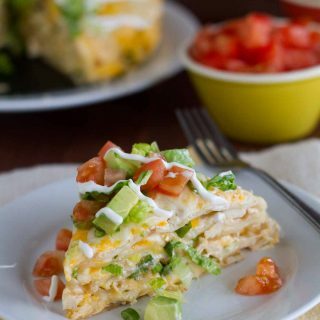 I love honey lime chicken enchiladas! I actually got the recipe from “Real Mom Kitchen! 🙂 It’s a must try for sure!!! My favorite weeknight meal is pasta! Add chicken, vegetables, or the type of pasta you use to change it up! 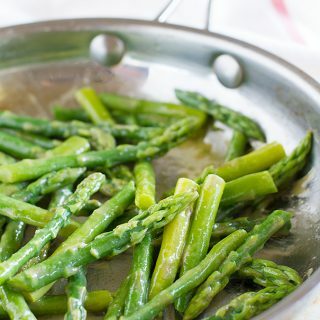 My family’s favorite weeknight meal? Roast chicken, mashed potatoes and gravy, and a vegetable dish. And the best part: there is always leftover chicken for a quick and easy lunch the next day! Has to be the only meal all 5 of my kids will eat. . . Beef Strogonoff with rice and fresh green peppers. Some avocado is always yummy too! I follow Real Mom Kitchen on Facebook! our favorite meal is my spaghetti and meatballs that I learned to make from one of my classmates during nursing school at UNM. It was the real deal taught generation to generation in her family. I feel blessed to have it as does everyone who eats it!! YUMMY!! Taco Salad is my new favorite! I love to have Taco Tuesday with my family. Same ol’ favorites around here…tacos, spaghetti, meatloaf, chicken enchiladas! I have to go with pancakes! We plan on having them once a week! I like a big salad with just about everything thrown into it. It’s not showing here, but I follow Real Mom Kitchen on FB… great blog & Taste and Tell too. Chicken stir-fry is my favorite and one I make often. My kids love making pizza on french bread. My favorite weeknight meal has to be grilled chicken and pasta- quick and easy! My favorite weeknight meal is hamburgers on the grill and onion potatoes in the oven. My favorite weeknight meal is chicken fajitas. 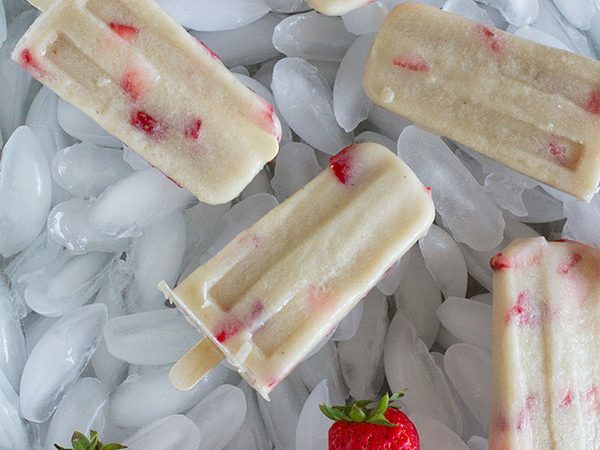 Cooks Illustrated has a fabulous recipe that is quick, easy–and delicious. We like Jamaican Meatballs in the crockpot! YUM! My favorite weeknight meal is grilled chicken, butter noodles, and asparagus. My favorite weeknight meal is grilled catfish or tilapia with tomato salsa, wild rice and a great salad with balsamic vinaigrette. That changes in the winter time though-it’s meatloaf and baked potato all the way then. I will be trying the fruit dip. It sounds good! I fFollow Real Mom Kitchen on Facebook. They are so easy and so yummy and they are the perfect thing to cook on the fly or you can plan ahead and play with meat recipes in the crock pot…..
My favorite weeknight meal is pasta with turkey meatballs (which I pull from a batch in my freezer!). 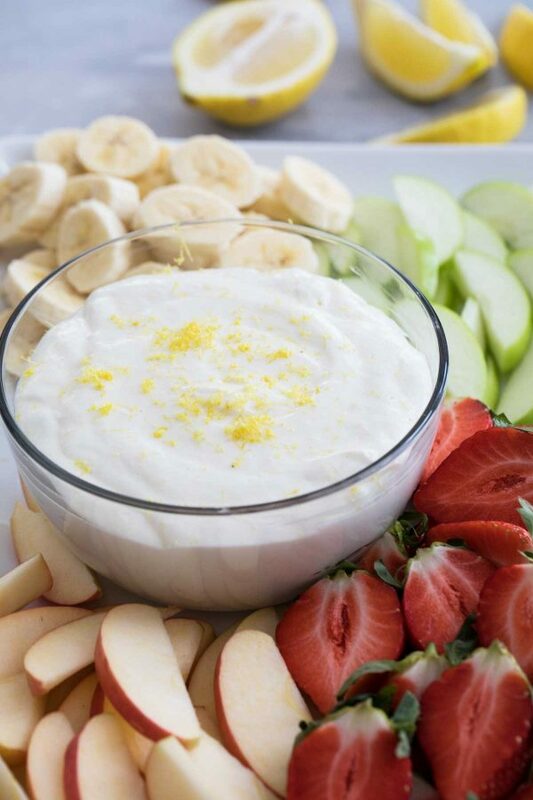 I love the fruit dip! I’m not sure if I could pick just one weeknight meal. My go to is probably any type of pasta dish, but I couldn’t narrow it down to one. I’m following Real Mom Kitchen on Fb. My favorite weeknight meal is homemade pizza. There is no complaining since everyone picks their own toppings! I have two favorite quick weeknight meals, quesadilla’s and omelets, both are cheap, easy and divine. I love that you can do endless flavor combo’s or use up what’s in the fridge. Favorite weeknight meal – pasta! I love it, it is super easy, and can be customized to whatever I have/need to use up! I follow Taste and Tell on Facebook as well! 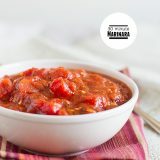 My favorite weekend meal is anything Mexican…cheesy, spicy, saucy, yum! Our favorite weeknight meal is Taco Salad..easy! I follow Real Mom Kitchen on facebook also! My favorite weeknight meal is spaghetti and meatballs. I can cook the meatballs ahead of time in the slowcooker, so it’s just a matter of boiling water after work. My favorite weeknight meal is chicken tenders with roasted potato wedges. I like Real Mom Kitchen on Facebook. I follow Real Mom Kitchen on Twitter @ 53PurpleRose. I like Taste and Tell on Facebook. I follow Taste and Tell on Twitter @53PurpleRose. Taco Salad is a favorite weeknight meal in the warmer weather. In cooler weather we like bbq pulled pork in the crockpot. During the summer we love to grill…chicken sandwiches or burgers are favorites! My favorite easy weeknight meal is black bean burgers mashed up, mixed with canned tomatoes and fried in a quesadilla. Yummy! I follow real mom kitchen on twitter! I follow taste and tell on twitter! This is an easy one-my boys LOVE curry chicken over rice. It’s our favorite weeknight meal and so quick (and cool!) in the pressure cooker. favorite weeknight meal- Baked Spaghetti-green beans-strawberry parfaits and butterhorn rolls. DELISH! I love any kind of salad! I Follow Real Mom Kitchen on Facebook As Kristi Summit. I Follow Taste and Tell on Facebook as Kristi Summit. 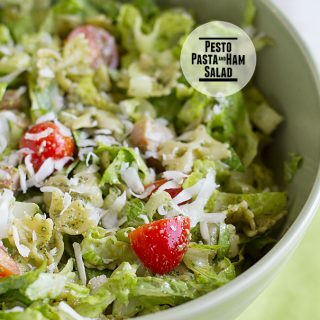 Favorite summer weeknight meal is a pasta salad. Our favorite meal is grilled lemon chicken. My favorite weeknight meal and any that I get to sit down and eat dinner with my family. Food is usually better when they are around no matter what it is. My favorite meal to make midweek is spaghetti. I love it! Pizza night is our family favorite. We alternate between tortilla or pita bread pizza, homemade from scratch, and Winco’s deep dish deli pizzas. Our fav is Taco Night! Do it yourself toppings. Great go to meal. my chicken tikka masala is an easy weeknight dinner. i place some naan dough in the bread machine and that is easy too and we all love it! chicken and rice with broccoli is a favorite as is spaghetti. I liked taste and tell on FB. I liked Real Mom Kitchen on FB. My fave weeknight meal right now since it’s summer is grill out food, like metts and brauts but something quick and easy since I work until evenings. I love making spaghetti and meatballs on a busy night.Thanks! Soft Tacos are a favorite at our house. One of my favorite weeknight meals is tacos because they’re so easy! I like Taste and Tell on FB, andisueks. My favorite weeknight meal is lasagna with salad. I follow Taste and Tell on twitter as frugalmomto4. I follow Real Mom Kitchen on twitter (frugalmomto4). I like Taste and Tell on Facebook (Amanda Corley). My favorite weeknight meal is chicken parmesan! I think my all time favorite is a good home cooked meal, chicken, mashed potatos and green beans! My favorite weeknight meal is Red and White Pasta. I make a real good Beef Stroganoff that hits the spot. Pizza is always a favorite at our house plus it’s so easy. My favorite weeknight meal is pizza! Hi I like to make buffalo chicken meatballs for a fast weeknight meal. I like Taste and Tell on FB…I also like to make tacos for weeknight dinners. Fave weeknight meal grilled cheese and tomato soup! I Follow Real Mom Kitchen on Twitter w/ katklaw777. I Follow Taste and Tell on Twitter w/ katklaw777. We like to have tacos or spaghetti during the week.